Regent Antiques has been trading in London for three decades. We specialise in English and Continental antique furniture, silver and porcelain. Our main markets are Europe and North America and we export worldwide. Antique Berlin KPM Porcelain Plaque Young Lady with Candle 19th C. This is a very finely painted Berlin KPM porcelain plaque, circa 1880 in date. The plaque features a beautiful young lady wearing a white night dress and a green and red cap. She is holding a candle which reflects stunningly in her charming smiling face. The plaque is painted in great detail to the highest of standards and it is housed in its original pierced foliate Florentine giltwood frame. It bears the impressed marks'MHR' and'811'. Add this beautiful image to any wall in your home. The plaque is in excellent condition with no signs of restoration. Please see photos for confirmation. Height 30 x Width 24 x Depth 3 - Frame. Height 17 x Width 12 - Picture. Height 11.8 x Width 9.4 x Depth 1.2 - Frame. Height 6.7 x Width 4.7 - Picture. The Royal Porcelain Factory in Berlin (German: Königliche Porzellan-Manufaktur Berlin , abbreviated as KPM), also known as the Royal Porcelain Manufactory Berlin and whose products are generally called Berlin porcelain, was founded in 1763 by King Frederick II of Prussia (known as Frederick the Great). Its actual origins, however, lie in three private enterprises which, under crown patronage, were trying to establish the production of "white gold" i. Porcelain in Berlin from the mid-18th century onwards. Before KPM was founded, two attempts had already been made to establish a porcelain manufactory in Berlin. Wegely hired first-class craftsmen from his competitors, and appointed the porcelain sculptor Ernst Heinrich Reichard to the post of chief modeller. However, technical difficulties and the Seven Years' War between Prussia and Saxony soon proved to be the enterprise's downfall. In 1761, the second porcelain manufactory in Berlin started its operations. Gotzkowsky concluded an agreement with Wegely's chief modeller, Ernst Heinrich Reichard, who was in possession of the secret formula known as the arcanum. Reichard received 4,000 t. Haler for the arcanum , and another 3,000 for the stock of porcelain and other materials. Furthermore, he undertook to work for Gotzkowsky as a keeper of the arcanum and as the manager. Gotzkowsky also agreed to take over Reichard's eight workers. Appreciated and supported by the King of Prussia, Gotzkowsky managed to attract important artists and qualified employees. Right at the start, Gotzkowsky appointed Friedrich Elias Meyer, a pupil of Johann Joachim Kändler who came from Meissen, to the post of chief modeller, and Carl Wilhelm Boehme to the post of head of the porcelain-painting department. Gotzkowsky bought another building next to his own property at Leipziger Straße 4, and he began to build a manufactory on the site. Nevertheless, Gotzkowsky's finances began to deteriorate. Since the royal exchequer was in the red on account of the war, Gotzkowsky believed that he stood little or no chance of obtaining assistance from the king. The end of the war also signalled the end for Gotzkowsky's manufactory. Today, the porcelain pieces from the early days marked with a W for Wegely und a G for Gotzkowsky are extremely rare and highly coveted collector's items. On 19 September 1763, Frederick II officially became the manufactory's new owner. He gave the business its name and allowed it to use the royal sceptre as its symbol. From then on, it was called the Königliche Porzellan-Manufaktur Berlin ("Royal Porcelain Manufactory Berlin") and became a model of how to run a business. There was no child labour, there were regular working hours, above-average incomes, secure pensions, a healthcare fund and assistance for widows and orphans. In 1784, after a four-year development period, the king's desire for a soft and delicate shade of blue was fulfilled. The colour was known as Bleu mourant ("dying blue"), and it was used to decorate Neuzierat , Frederick's favourite dinner service. The colour was predominant in the king's private chambers at Sanssouci Palace and in the blue chamber of the New Palace in Potsdam, as well as in other castles. As owner of KPM, the king used the "white gold" as an effective means of diplomacy. Almost all of his diplomatic presents came from the manufactory, and they were to be found at the court of the tsars in Russia and on the tables of European aristocracy. Under Frederick the Great's successor, his nephew Frederick William II, the manufactory became a technologically leading enterprise. The new king obtained what he needed in the way of porcelain from KPM, but stopped paying cash. The amounts due were deducted from his share of the profits. From 1787 onwards, the average annual net profit came to more than 40,000 thaler. Take a tour of our London showrooms. Take Piccadilly line to Manor House station. Go to top of escalators and turn left. Take exit 7 and walk straight on for 10 metres. Manor Warehouse is on the right. There is car parking available on site. Please make all cheques payable to Regent Antiques. Bank details: Regent Antiques - BBVA - Account: 05701615 - Sort: 23-59-11. For the best value, we recommend offsetting this cost by purchasing multiple items. 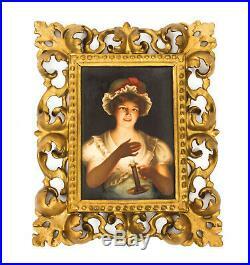 The item "Antique Berlin KPM Porcelain Plaque Young Lady with Candle 19th C" is in sale since Monday, April 1, 2019. This item is in the category "Art\Paintings". The seller is "regentantiquesuk" and is located in London N4 1BX. This item can be shipped worldwide.